One final attempt to catch a fish, any fish, before the year's end came to nothing despite the river looking great and rising in temperature. Still, it was a more pleasant experience than last time with next to no wind and an overcast sky keeping the air temperature up after dark. Even though I blanked it's made me keen to get out again. Things can only get better! If 2007 had carried on as well as it started of I'd have had a phenomenal year's fishing. As it was things started to fizzle out around October. Even so I'm not complaining. I beat my bream pb three times, my perch and tench pbs twice, caught a pb barbel and my first ever grayling. Unlike 2006 I got the springtime perch fishing in, paying off big time, and the tench campaign worked more or less to plan this time round. The double figure bream were also a nice interlude. Again I enjoyed the fishing, especially exploring new-to-me stretches of river in search of barbel. Fishing new and different places - and catching fish doing it - is always enjoyable and enlightening. 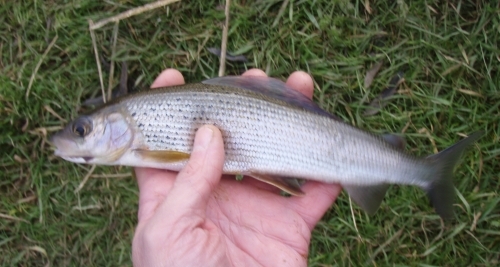 Grayling - not very big! At last I managed to drag myself to the river almost a month since my last session. Now all the leaves were gone from the riverside willows and a flood a few weeks back had cleared away most of the remains of last summer's bankside vegetation. It was truly a bare and wintry scene. But not unappealing. After a couple of days rain I thought the river might be well up and coloured. It was up a little, carrying some colour and just about warm enough to give me hope. Within twenty minutes a chub pinched my luncheon meat. Then things started to go down hill. The next three quarters of an hour were spent with the bait in a snag. I got the rig back and moved. During the afternoon I fished four more swims without a touch. Although the air temperature was around seven degrees and the sun was shining it felt a lot colder owing to the wind. When a shower came along I risked the brolly and it was quite pleasant sat in its shelter. However I noticed that there was debris starting to accumulate on the line, one or two branches were coming down the river, and it was on the rise. Walking into the wind to fish a fifth swim was quite a struggle. But once set up again it was fairly cosy with the brolly up. Then the rain set in. This made it all very miserable. The wind also strengthened. This made it extremely unpleasant. Had it not been so wet and windy I'd have stayed later, but I was indeed 'glad when I had had enough'! So strong was the wind that on the way back to the car I had to stop twice as gusts hit me as I could hardly make any progress against them. The video clip doesn't do the weather justice. I haven't managed to get out fishing for the last three weeks owing to having rods to build and send out for Christmas deadlines, and the dreaded waste of time that is hanging around for parcels to be delivered so that I could fulfil those orders. This gave me spare time sat around while waiting for things to turn up and for glue and varnish to dry. 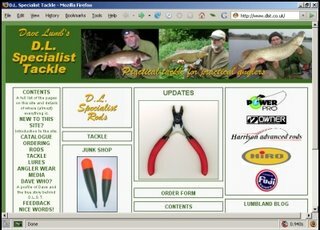 Whether it needed it or not I decided to freshen up my www.dlst.co.uk website. All the content is the same but I think it looks a little bit cleaner and brighter. I might make a few more nerdy tweaks to it over the Christmas period. One is never satisfied. Despite all this keeping me off the rivers when they rose a few weeks back I can't say I've missed sitting out in the cold that hit us a week or so ago. Maybe I'm getting soft in my old age. But I don't care! If I don't post again before Christmas I hope you all (I assume there is more than one of you reads this rubbish) have a good one!